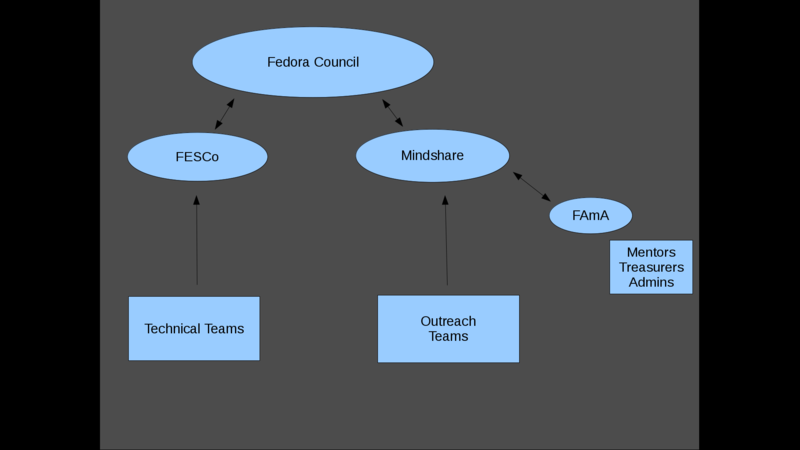 The Fedora Mindshare Committee represents the outreach leadership in Fedora. Mindshare aims to help outreach teams to reach their targets in a more effective way, by unifying and sharing their working process through an optimized and standardized communication. It consists of mostly appointed, but also elected members. Communication between teams (outreach teams rely on the work of other groups). Mindshare ensures all information from technical teams will get out in time to all outreach teams, working out also a common strategy with Marketing of how to communicate them outside and how to manage them within all outreach teams. Ambassadors activity: Mindshare will create templates to help ambassadors to work more effectively. Not only by providing report templates, but also by asking them once a year to compile a short survey. This can help to get real information whether an ambassador is active or not and will not result too binding. Mindshare takes over all decisional responsibilities left on FAmSCo. Administrative responsibilities will be handled by FAmA, which will consist mainly by treasurers and FAmA admins. CommOps leads the communication between technical and outreach teams. Sharing best practices: one of the Mindshare’s goals is to take down barriers or whatever is blocking sharing best practices. All teams and all regions can learn from each other and apply successful practices to their local community. Mindshare will also try to unify ambassadors more and more, also by dropping the actual Regions. They are not helping communication and were created mostly for organizational aspects. FAmA (with treasurers) will help to sort out regional aspects and meetings, but having a unique ambassadors group will help in several ways to be more effective again. Budget: Without regions also the (ex-)regional budgeting process changes. Mindshare will, in collaboration with the FCAIC and consequently with the Council, take care of the Fedora outreach budget (sum of the 4 regional budgets). Minor funding requests can be handled directly by FAmA and treasurers, more important expenses will go through Mindshare, in order to be able and track even necessary reports the Council needs. Marketing as part of Mindshare will drive the other teams by providing messages, strategies and talking points for ambassadors. A good collaboration with the other teams is necessary. Many basic decisions are made through a process known as "lazy approval", in which general consent is assumed unless valid objections are raised within a period of time — generally three to seven days, although the timeframe should be stated each time and should be proportionate to the impact of the action. This process is used for decisions with short-term consequences and which can be easily reversed. Any project member can ask for the deadline to be extended or the decision escalated to require full consensus. More significant decisions are made through a process of full consensus. In order to pass, these decisions need three positive votes (+3) and no negative votes (-1). A negative vote immediately halts the process and requires discussion. Therefore, in order to remain valid, negative votes must be supported with a specific concerns about the poposal, and suggestions for what could be changed in order to make the proposal acceptable. A vote of "0" is sometimes used to indicate a disagreement but willingness to stand aside; this should also be accompanied with an explanation. This model matches Fedora’s "Friends" foundation, which calls for finding acceptable consensus to serve the interests of advancing free software. It works because we work together in a community of mutual respect even when we disagree. In general, Mindsharel conducts business in public discussion, and any Fedora project member can add more opinions and thoughts. It is the duty of the Mindshare Committee to take concerns raised in this way into serious consideration, but only Mindshare members' votes are binding in the final tally. Note: The minimum of elected representatives is 2; 3 representatives are elected when the number of seats would otherwise be even. The Mindshare Committee uses two mailing lists: a regular discussion list and an announcement-only mailing list. mindshare is a public discussion list. This is the main discussion point for the Mindshare Committee. The goal of the list is to either reach a decision or delegate a thread to a more appropriate location. mindshare-announce is a low-traffic, announcement-only mailing list. This list is used for occasional updates, news, and announcements from the Committee. Posting privileges are limited to Mindshare Committee members. Consider subscribing to this list if you want to stay informed about ongoing activities within the Mindshare Committee. Mindshare Committee members are present in the #fedora-mindshare IRC channel on the Freenode IRC network. This IRC channel is also bridged to a Telegram group for convenience. Messages are synchronized between the two. Telegram users can join here. The Mindshare Committee operates in a ticket-based workflow. If you have an issue or task for the Mindshare Committee, open a ticket on the Pagure instance. This is a public issue tracker. If you have a privacy- or security-sensitive issue, check the Private box when creating the ticket. The Fedora Mindshare Committee does hold regular public IRC meetings to discuss current issues, to clear through anything outstanding which can be quickly resolved, and to ensure that nothing important is left in limbo. All members are be expected to regularly communicate what’s going on in their area, through blog posts or other public updates.